With the addition of three new dolls to my doll family last week I felt it was time to take an updated photo of my doll family. Here are my girls having a welcoming party for Thaddeus, Siobhán and Sidonie! My goodness how my collection grown in the past year and a half! Naughty Mr. Snuggles is sitting on the table! 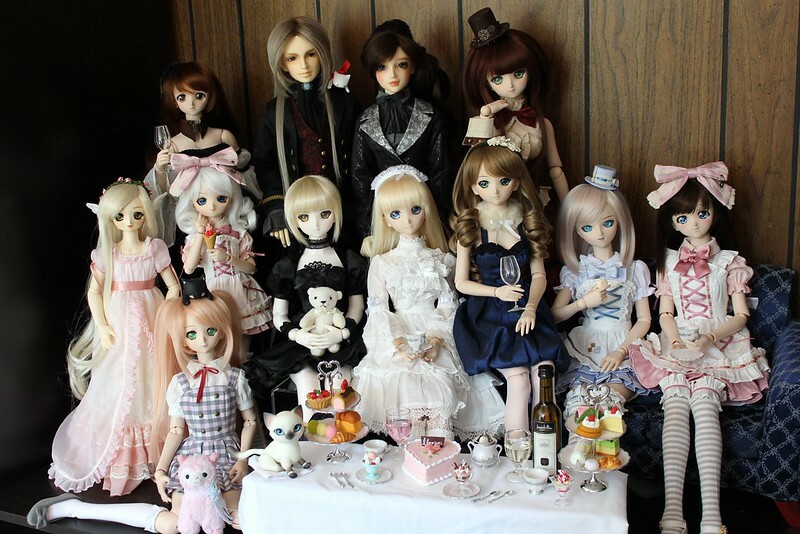 This entry was posted in BJD Misc, Dollfie Dream, Volks Super Dollfie and tagged Alisanne, DDS, Dollfie Dream, Gabrielle, Hinata, Lily, Mélisande, Medée, Moe, Thaddeus, Volks, Yukiko by archangeli. Bookmark the permalink. Yes, it’s never just ONE doll >__<" And now I have a boy too! Gabi is wearing a Miruya wig that I bought for really cheap at Mandarake. She just looks really cute in peach twin-tails. I have another Volks ones that I sometimes put on her, but the Miruya one is easier to take care of.